Establishing on the foundation of the Last Hope VR Serious Sam experience, Croteam are bringing the very first Serious Sam game to virtual reality next week. Creatively titled Serious Sam VR: The First Encounter, this version allows Sam to actually move around the backdrop of Ancient Egypt, to gun down the hordes of demons, monsters and the evil warlock Ugh-Zan III. Looking for a gentler VR experience? Here’s a list of some of the best VR games available now. 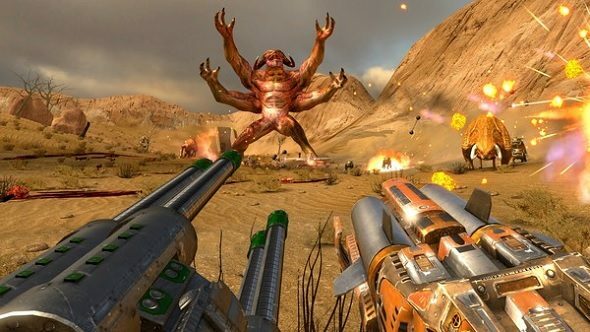 Unlike Serious Sam VR: The Last Hope which has Sam and a pal rooted to the spot, blasting oncoming enemies like a super intense shooting gallery, First Encounter lets Sam run at full pelt, should your stomach be able to handle it. For most people, they will choose to simply teleport from location to location, warping out of the way of oncoming nasties before blowing them to kingdom come. If you are brave enough, you can dual wield two weapons using two motion tracked controllers, resulting in mad combinations of chainsaws being used at the same time as miniguns and so on. As First Encounter VR is an Early Access title, elements of the VR will be tweaked and improved as time goes on, so expect some teething problems to start. One of the real draws of this version of First Encounter is playing Serious Sam multiplayer with up to 15 other players in VR. You can run through 15 specially made co-op campaign levels, with the ability to tweak enemy strength per player, the number of lives, frequency of weapon drops and so on. Competitive multiplayer is also available, with both team and free-for-all game types. First Encounter VR will also support Steam Workshop, meaning new levels, guns and monsters to make your VR campaign even more intense. I can only imagine some of the mad, vomit inducing maps some sadistic modders will make for unsuspecting users. This is a game to not play on a full stomach so don’t eat that whole pizza before whacking the headset on to play. Serious Sam VR: The First Encounter will be available on Steam from December 20 and as the name suggests, requires a HTC Vive or Oculus Rift with motion tracked controllers in order to play. Maybe buy some plastic sheeting to put down as well, don’t want any spillages while playing.